Welcome, welcome faithful listener to The Shat- Oh, um… that’s not right. Welcome to PodTea’d! No Jay this week, as he had to state his case in front of the Time Lord council to argue his innocence over that time he stole a TARDIS. Don’t worry, he’ll be done by next week (our time anyway, he could have aged thousands of years for all we know). This week Vid takes up the hosting duties and the guys discuss the recent happenings at E3 in a disjointed and messy manner, as well as a healthy dose of Animal Crossing and the usual mention of Oddworld. 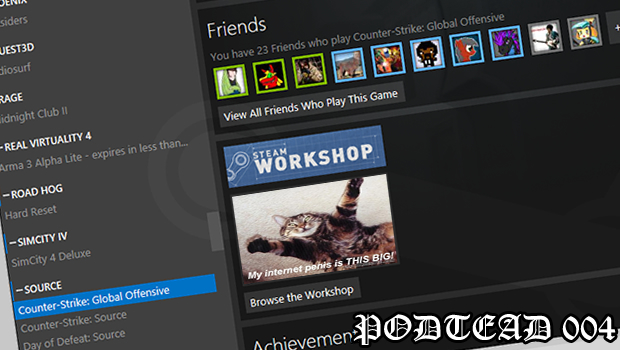 Oh, and Adam has a massive Steam library. It glistens in the sunlight. Oh, and sorry it took so long to get this out. It was recorded on Monday, but everyone involved has been hideously busy this week. I promise we’ll be doing something about the schedule soon. Honest. Your host this week was Vid Cirman with Jesse James, Adam Owen and Sam Morris. Edited by the wonderful Matt Turner, album art by the massively e-endowed Adam Owen.